With over 175,000 plug-in vehicles in America today, and new versions constantly being introduced to the market, electric vehicles are proving to be more than just a trend. The last few months have seen record growth in electric vehicles. I personally enjoy driving my Prius Plug-In…17,000 miles in little over a year! As this adoption of electric vehicles becomes more prevalent, the charging requirements of the future are subject to change. 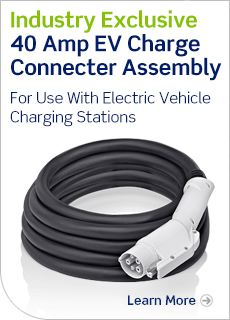 The next generation of electric vehicles will likely utilize larger on-board chargers, which will require charge connector assemblies with higher rated current capacity. A few vehicles that you may want to look at include the RAV4 and the Mercedes B-Class Electric Drive. Both these vehicles are leaders in larger on-board chargers that ideally require EVSEs that can handle up to 40 amps of current. Why wait to charge? Are you part of the electric vehicle trend yet? Tell us what you love most about your EV in the comments below!